A crew of five OPPD linemen spent three days in the Fremont area during the height of the March 15 flooding searching for drivable roads to keep up with calls. The area – turned into an island by floodwaters – saw plenty of devastation. The crew, with more than 70 years’ experience between them, saw cars abandoned in high water and people evacuating their water-submerged homes in rescue boats, all under the constant thrum of Blackhawk helicopters overhead. 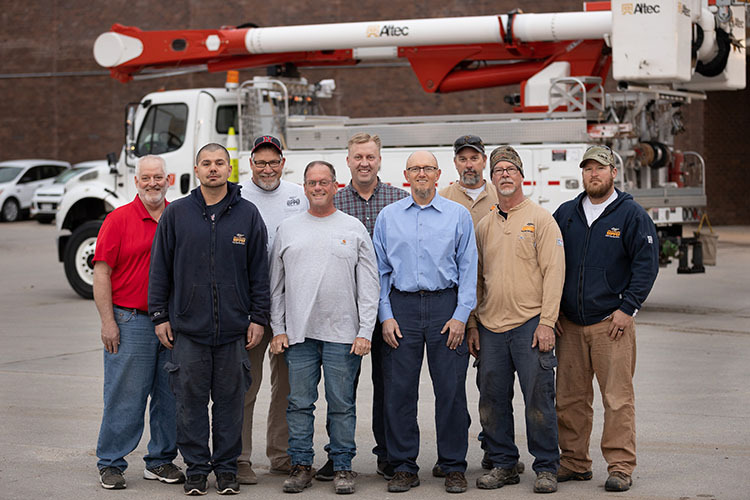 The five – crew leader Bruce Hamel, Clayton Auer, Travis Grell, Kevin Schulze and Dustin Cabrera – kept busy reconnecting, and in some cases disconnecting power (at the request of emergency management agencies), to customers in the area. They helped maintain power at a substation. At night they slept in their trucks. Just don’t call them heroes. They won’t have any of that. And, Hamel stressed, every crew at OPPD would have done the exact same thing in that situation. In fact, they already have. Every time a bad storm hits, every time another state called for mutual aid, every trouble call or restoration job. They do this kind of work every day. Friday, March 15 started out as a normal day for the crew. Heavy rains had ended and the sun was out. They had a trouble call in Valley where a circuit tripped and one customer remained without power. Shortly after crossing the bridge on Q Street to respond to that initial call, the bridge was closed and would remain so for three days. That afternoon, more bridges and highways closed as flood waters quickly rose across the region. The road into Valley was clear. Auer said it was covered with water an hour later. 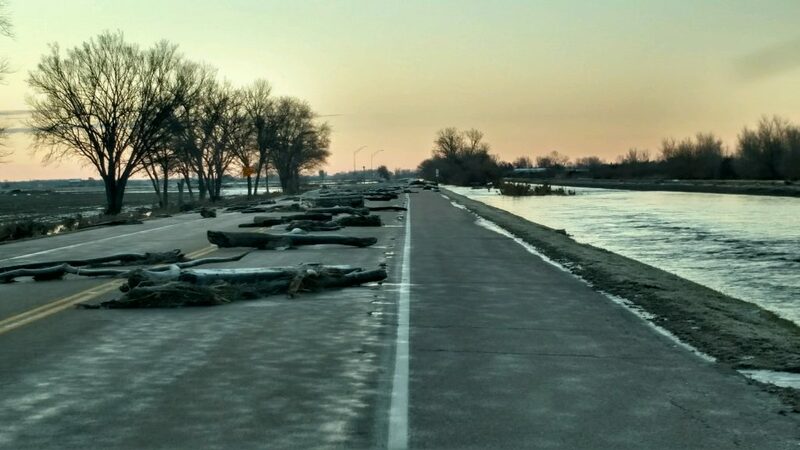 Debris from the Platte River is strewn across U.S. Highway 275 near the junction with State Highway 36 southeast of Fremont. “We had to take the onramp to get back on, the water came that quickly,” Auer said. The crew saw how quickly the situation deteriorated. Soon they saw rescue boats everywhere and the constant hum of Blackhawk helicopters overhead. It looked like they were surrounded by a giant lake. But they kept working, kept responding to calls. They spent days criss-crossing among Hooper, North Bend, Fremont, and Valley, often taking different routes each time as roads deteriorated. They relied on Joe Kreifels, an OPPD linemen from the North Bend area, to relay the best routes. The crew was able to restore the town of Fremont after an issue at a substation. Hamel said the most stressful work was at a substation near Valley. OPPD was worried a substation in the Valley area, which helps power Fremont and some industrial customers, was going to take on water. An ongoing fiber optic network expansion project left a transmission line out of service that would soon become a critical connection between OPPD and Fremont. Final work had been scheduled for around the time the flood hit and Operations requested the line be restored quickly to provide an additional interconnect between the two utilities. Dave Huston, an OPPD senior designer with 33 years experience, works in the field performing transmission inspections. As the contractor was finalizing the restoration of the line late Friday, Huston went to the Valley area to check on the substation that would soon energize the line. But flood waters cut off access to Valley and Huston turned around and spent Friday night in his truck in Fremont. Early Saturday morning, March 16, Huston found a route to the substation and found it was filling with water, despite a berm around that sub as water was getting in through conduits that led outside the berm. In the span of hours, after a lot of phone calls and exchanging cell phone pictures, Huston was able to relay critical information about the sub’s condition and started coming up with a plan to protect the sub. Huston, through his contractor contacts, got five pumps and a generator. He positioned them around the substation trying to pump water out and keep the equipment safe. However, he needed help. Huston was going to have to “babysit” the pumps to make sure they could keep removing water to keep that substation safe. A local construction company OPPD contracts with provided fuel cans. Brian Kramer, manager of Substation & System Protection, asked Huston if he could close the switch if they talked him through the steps. Huston wasn’t comfortable attempting it. Seconds later, Huston saw an OPPD truck driving by the area. Kramer was able to contact the crew, Hamel’s crew, who would come to assist. A substation near Valley took in large amounts of floodwater. 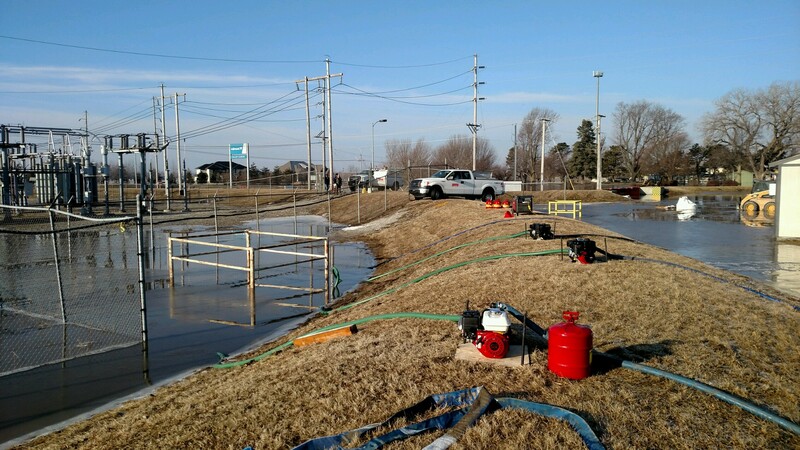 OPPD workers hatched a plan to pump water out and save the facility. Hamel and crew were there because the original trouble call originated out of that substation near Valley. They did the work and thought they were in the clear. Later in the day, the substation lost service, which meant no outside power to the substation. The battery backup could only run for about 10 hours. He was. But this was a much more complicated situation, Kramer said. This would involve troubleshooting the problem, de-energizing equipment and other complicated tasks. Kramer and Dave Post, field supervisor of Substation Construction, safely walked Hamel and crew through the process to de-energize the equipment, find a broken fuse, replace the fuse, re-energzie the equipment and restore station service. They also found the duct leak where the water was flowing in and plugged it with a rag. It was a six-hour operation. The work of Huston and Hamel’s crew, saved the sub and kept power flowing, Kramer said. Kramer marveled how all these different people and organizations, including contractors and a local business, came together in a high-stress situation. By Monday, March 18, the crew could drive out of the flooded area. Although the waters had receded, the devastation struck them. Roads driven on just days before were buckled and in ruins. Trees wrapped around power poles 8-feet in the air. A camper sat in a field, which looked more like sand dunes than farmland. Another field had a huge soccer goal pinned in the corner. No soccer field was in sight. 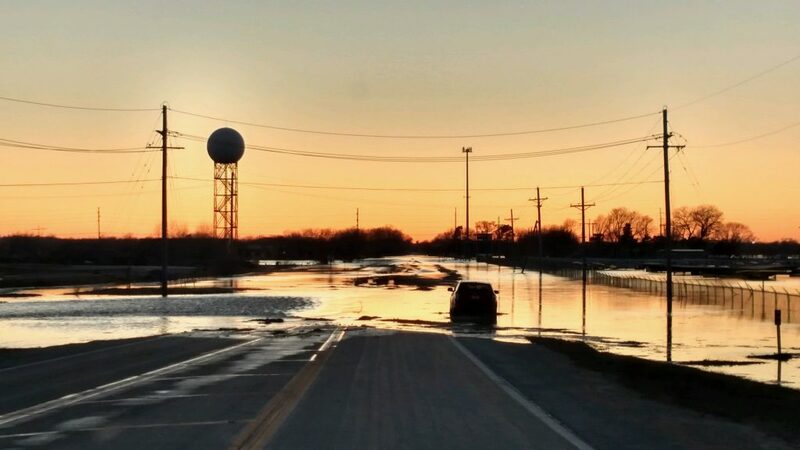 Floodwaters covering Ida Street near the National Weather Service in Valley, NE at sunset. Thank you OPPD and your crews! !